Another supportive article on the BBC website quotes a number of the leading English players questioning why squash was left out of the London 2012 Olympic Games. With so many of home-grown players - both men and women - in the top 20 in the world, many see this as a lost opportunity for Britain to win medals in 2012. 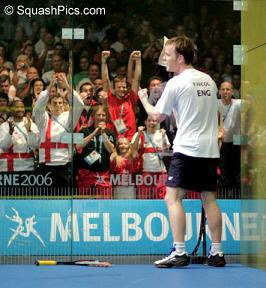 Speaking from the successful Canary Wharf event that Peter Nicol promotes, the now-retired squash legend says that it "hurt like hell" when his sport was denied a place in the London Olympics, though he adds: "We have a very realistic chance of getting in for 2016 - I think it's just a matter of time." 26 year-old Nick Matthew is also quoted, lamenting the fact that he and other young English players will be past their peak should squash make it into the 2016 games. An even more supportive "606" article on the BBC takes up this theme and asks readers for their comments - have your say! 2012 Olympics: Squash funding to suffer?